MNIST has 60k training examples and 10k test examples. For this model we have 10 classes to classify: 0, 1, 2, 3, 4, 5, 6, 7, 8, 9, which represents the digits 0-9. 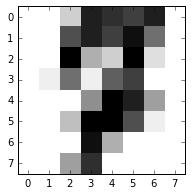 Each example in MNIST is a 28x28 pixel image represented by 784 greyscale intensity (0-255) features. Each class will modeled by a multivariate 784-dimensional gaussian. In other words we have a 784-dimensional feature vector and 10, 768 degree multivariate gaussians. Before we get started on MNIST, lets work on a smaller scale w/ the iris dataset. 4 Features/target. 4 classes. So each class would have a 4D M-Gaussian. This is actually a really good model for IRIS b/c gaussians follow the random patterns in nature and iris is samples from nature. Now, what scikit did was to fit a gaussian to each of the classes (3) in the training set examples. It does that by finding the mean and the covariance from the examples. Let the Gaussian for the jth class be: $P_j = N(\mu_j, \Sigma_j)$. Easy huh? Now, the devil is in the details: how do you calculate $P_j$, how do we estimate a gaussian for each class j? Therefore the trick is to tune $\Sigma$, the covariance matrix, to model the training data. Now according to the above assertion this should map to a 4x4 covariance matrix. We can use numpy.cov to test this assertion and then look at how to implement the equivalent numpy.cov in python. So it seems to be a functioning classifier. Now lets scale this up and test it on the digits dataset. So from the above we can see the bayesian prior probabilities for the 10 classes 0-9 which looks like a pretty even distribution. Now lets generate the bayesian posterior probabilities for each class using the training data. [  0. 0. 3. 14. 13. 12. 14. 0. 0. 0. 11. 14. 12. 15. 9. 0. 0. 0. 16. 5. 3. 16. 2. 0. 0. 1. 9. 1. 10. 12. 0. 0. 0. 0. 0. 7. 16. 14. 6. 0. 0. 0. 4. 16. 16. 11. 1. 0. 0. 0. 0. 15. 5. 0. 0. 0. 0. 0. 6. 13. Notice that the probabilities are VERY small. In this discrete environment we may be losing a lot of precision, so it may be wise to explore using the log_pdf instead. We will explore this more later. Our naively implemented Gaussian Classifier achieved a 96% success rate. The above figure shows what the classifier expected and what the actual classification. From the error examples above, some of the examples would even be mistaken by a human. The scikit version of MNIST is a scaled down version. If we run this classifier on the official MNIST, we will run into some limitations. The MNIST version has 784 features which digits only has 64 and MNIST has more examples: 60,000. At this scale the model starts to have issues taking the determinate of the covariance matrix and we also start to have issues w/ underflow in the probabilities. Through experimentation I find that a value around 3500 works well and achieves %96 on full MNIST. When the classes are well-separated, the paramter estimtes for logistic regression model are suprisingly unstable. Linear discrimiinate anlysis does not suffer from this problem. If the number of observations is small and the distribtuion of the predictors (features) X is approximately normal in each of the classes, the linear discriminant model is again more stable than the logistic regression model.